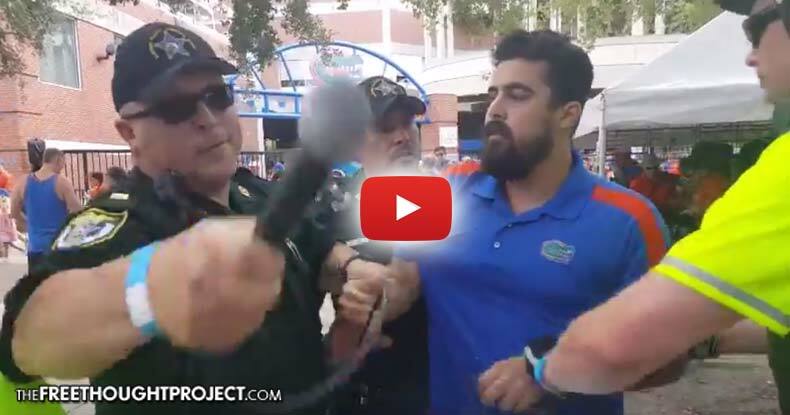 9/11 – Don’t Mention Tower 7 – Coercion Code – "Dark Times are upon us"
Bob Tuskin, former radio host for Free Thought Project Radio and co-founder of the Free Your Mind conference, was conducting street interviews with folks outside of the Florida Gators game this weekend, when he was swarmed by cops and arrested — without reason. Outside of the stadium, multiple other political and religious groups were demonstrating peacefully. However, only Tuskin was targeted. There were Trump supporters, religious speakers, and various other groups who the police completely ignored. Tuskin was not harassing anyone, nor was he causing any problems whatsoever. Tuskin simply asked passersby if they would like to watch a video of a building collapsing — and for this, he was kidnapped by armed agents of the state and put in a cage. Tuskin’s schtick was simple. He would show people a video of a building collapsing in six seconds and then ask them what that looked like to them. Everyone replies the same, saying it looks like controlled demolition. But when Tuskin tells them that this building is Tower 7 and fell on 9/11, he’s quickly met with denial, angst, vitriol, ridicule, and now police force. Below is a video from last year, when Tuskin conducted the same interviews. Notice how the police in this video were actually nice and participated — instead of kidnapping and caging Tuskin. Apparently, one of the people who became offended after watching Tower 7 fall this weekend called police, who had no problem acting as attack dogs to violate the First Amendment. As the video shows, when police arrive they demand Tuskin and his crew leave. Tuskin, knowing his rights, immediately and politely refused. This assertion of his rights infuriated the officers. Tuskin quickly found himself surrounded by Alachua County Sheriff’s deputies who were threatening him with arrest if he didn’t stop practicing his free speech. When Tuskin asks the deputies what he’s being arrested for, they cannot give him a clear answer, but they continue with the threats. Not wanting to be arrested, Tuskin concedes and begins packing up his things to leave. However, Lt. Lalonde, with the Alachua County Sheriff’s department, did not feel like waiting for Tuskin to leave and quickly moves in to deprive him of his freedom. While they were placing him in cuffs, the deputies can be heard telling Tuskin to ‘stop resisting.’ Apparently, it has simply become second nature for officers to repeatedly say this phrase during arrests as Tuskin never resisted. For practicing his freedom of speech, Bob Tuskin was handcuffed and brought to a holding cell. However, knowing that they had absolutely nothing to charge him with, police were eventually forced to let him go — but not before silencing his freedom of speech. Showing the video of Tower 7 collapsing has nothing to do with the realm of conspiracy theory. However, in a society rife with ignorance and corruption, as the video below shows — telling people the truth is now a revolutionary act.